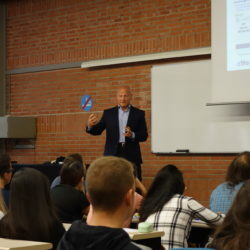 Yesterday, Ignacio Guerra, CEO of Alfa Consulting, gave a guest lecture about Corporate Social Responsibility (CSR) at Universitat de Barcelona. 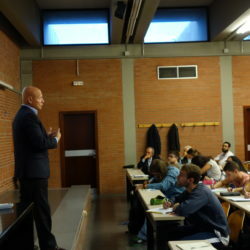 The conference, organized by Cáritas Barcelona, took place at the Faculty of Economics and Business at the Universitat de Barcelona. The lecture was introduced by Fernando Portas, volunteer from Cáritas, who explained the importance of RSC as well as all the work Cáritas does. He also talked about the program “Empresas con corazón” (Companies with heart) that was created 16 years ago. 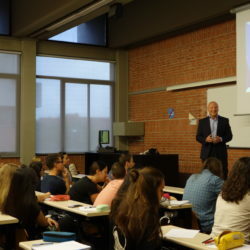 Since 2002, Cáritas Barcelona has been developing an innovative program of collaboration with companies, foundations, sports clubs and universities called “Entities with heart”, and “Companies with Heart” is part of it. Ignacio Guerra, was next with his presentation. He talked about the beginnings of Alfa Solidaria, a solidarity program the company has been implementing for over 20 years. Guerra then explained the most recent collaborations within this program, such as a volunteer day trip with seniors, or a Pro Bono consulting service for Cáritas, among others. He also stated that CSR starts by properly managing the company complying with is obligations towards the society and the employees. Guerra also exposed that the main objective of Alfa Solidaria is giving back to society but that it also helps the company branding. This positive impact can be measured both externally and internally. It helps a company increase its visibility and attract new clients, but also helps with the sense of belonging in the workplace and recruit new talent. Alfa Solidaria was created to develop our corporate value of involvement more strongly. In the past 21 years, Alfa has collaborated with over nine NGOs and has allocated approximately 2% of the income to this program. You can click here to read more about other collaborations.